Leads from inbound sources like SEO and social media not only cost less than traditional outbound leads, they also convert to sales opportunities at a higher rate. But how do you generate more of these high-quality inbound leads for your sales teams? 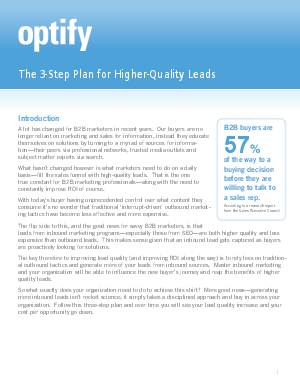 Download The 3-step plan for higher quality leads. Get The 3-step plan for higher quality leads and start generating higher quality leads today.